I recently participated in the Food Blogger Cookbook Swap, hosted by Alyssa of Faith of An Edible Mosaic. You send a cookbook out and receive another from a fellow food blogger in return; such a fun exchange. Oh course I wondered who would get my name? Will my secret blogger like my site? Will the receiver of my cookbook like my selection? With such a beautiful blog, I can only hope that Jenna from Olive & Herb will enjoy the cookbook I sent to accompany her in the kitchen. I have to admit, I let out a little ‘Yay’ when I received my new cookbook. Plenty is one that I have seen many times at the bookstore. I have even gone online to order it a couple of times, gotten distracted, and in turn left it sitting forever in my checkout cart, never officially making it to my table. I just want to say thank you so much to Ansh for inspiring me through her blog Spice Roots and for finally allowing me to have Plenty present in my Kitchen. Inspired by my new cookbook, I couldn’t wait to try a new recipe. There were so many that caught my eye. Many of them containing tomatoes as the primary ingredient, which I will also be exploring when warmer weather arrives. 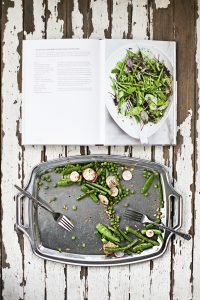 I chose ‘Green Bean Salad with Mustard Seeds and Tarragon.’ Beautiful in the photo, this sounded like the perfect winter time salad, and the green beens at the grocery have been extra inviting lately. I did change a couple of ingredients that I could not find or do not favor. As you can tell from the last photo, the salad turned out pretty tasty! First, wash and trim your green beans, snow peas, and snap peas. Fill a saucepan with water and bring to a boil. You are going to blanch your vegetables, making them bright green, crisp, and tender. In another large bowl, fill with ice water. Once your water is boiling, add your green beans and keep boiling for 4 minutes. Add snow and snap peas with 1 minute remaining, and green peas with 20 seconds remaining. So, blanch green beens for 4 minutes, snow peas and snap peas for 1 minute, and green peas for 20 secs. Drain and refresh in ice bath until all are cool. Drain and let dry. You may pat dry with a towel. *In Plenty they blanch all their vegetables separately. I just added them along to cut out extra steps, but they may have a better reason of doing it the other way. Let me know if you have ideas. I am by no means the blanching expert. Next, place coriander and mustard seeds in mortar and pestle and give them a few rounds. No need to crush too fine. Place the seeds in a saucepan, along with olive oil and tarragon and sauté for 2-3 minutes until seeds start to pop. Then pour over your beans and peas. Lastly, add thinly sliced radishes, a sprinkle of homemade ground red chili, juice from 1 squeezed lemon, zest of 1 lemon, sea salt and a sprinkle of sunflower seeds to taste. Enjoy! !